We are using a lot of PowerShell for configuring Office 365 tenants and Exchange Online. When getting new requests, I usually use my existing PS-Scripts to connect to Exchange Online, modify them, execute them and that's it - that's the real world scenario. 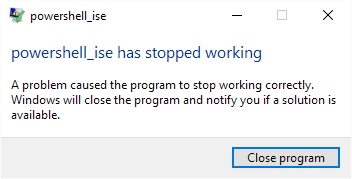 Recently I had the issue that - when connecting to Exchange Online - I always got the error "PowerShell has stopped working" or when using PS ISE "PowerShell_ise has stopped working". Open Run, type PowerShell_Ise -NoProfile or PowerShell -NoProfile and hit Enter. Does it open? If so there maybe issues with the Profile. Run System File Checker sfc /scannow and see if it helps. FYI, ISE needs .Net 3.5 (repair .net framework). Reinstall the Windows feature "PowerShell". Then I found out the (simple) reason. See my full connect.ps1 script here. I had in mind that the URI was renewed (some time ago), but simply had forgotten about this. When using the correct -ConnectionUri value "https://outlook.office365.com/powershell-liveid/" everything works again. Thanks!! Solved my problem exactly.